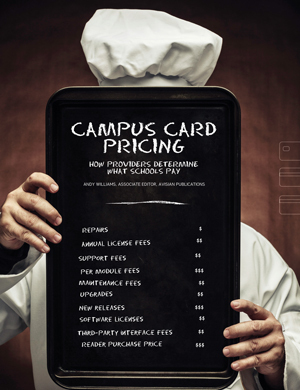 From cloud-based services to software delivered on-site, colleges and universities have a myriad of options for handling their card programs. Understanding the ways in which the different vendors determine their fees is essential to making informed buying decisions. While the systems from campus card providers serve similar needs and offer similar services, the manner in which they charge for these services can be very different. It’s not a one size fits all pricing structure for any of them. Most frequently pricing depends on size of student population and what functions the school opts to deploy. For example, you could start out with the company’s dining module and financial services module and later add access control. “It’s all done in a modular fashion that provides flexibility and keeps costs down,” says Emery. This, he adds, allows the client to budget accordingly. Little has changed with CBORD’s licensing policies over the years. “From the very beginning in 1975, we licensed software with an initial licensing fee and then an on-going licensing fee that covered software versions as well as maintenance and support,” says Read Winkelman, CBORD’s vice president of sales. Allison Duquette, vice president of global sales and marketing for Blackboard Transact, says the company’s annual license fee includes support and maintenance. “That also includes ongoing research and development for one all-inclusive price,” she adds. The license fee also covers new releases of the product, says Duquette. “If we move to an entirely new platform the annual license fee will simply transfer,” she adds. When first approaching a campus, Blackboard wants to know the number of students and what the school wants to accomplish with the card system. From there Blackboard will let them know the types of services it can offer and at what cost, says Duquette. Blackboard has eight pricing tiers covering schools with less than 2,000 students to schools with more than 150,000 students. The annual fee is based on the number of students to be covered by the service, says Duquette. Heartland also bases its module cost on the number of cardholders. “Software modules are licensed in year one and year two we charge maintenance/licensing on that module at 15% a year,” he explains. This annual maintenance/license fee includes upgrades to software, 24/7 support and access to user groups. “We charge a lower price for smaller institutions. The software is designed to handle any size population. There are a couple ways we can scale it, based on cardholders and then scale it down for smaller institutions,” says Winkelman. CardSmith also offers up to a five-year contract for its clients. “It may not be the same price for all five years but they would know what their price is going to be,” says Farley. The common denominator for all of CardSmith’s programs is transaction management, beyond that, it’s À la carte. “Customers can just choose the transaction service and a lot of them do,” adds Farley. That includes the core necessities for a campus card program, including dining, bookstore, vending and copy machines. The fee also covers support. “Our thinking is that the customer should have a single point of service experience. So, annual fees are aimed at achieving this goal. In addition to 24/7 help desk support, annual license fees also cover versions, patches and some upgrades,” says Winkelman. With Heartland, modules can be chosen À la carte with discounts based on the number of modules a university orders, says Emery. Its four base modules include the core functions most clients utilize: dining/meal plan; building access; financial (vending and debit); and recreation and events (equipment rental and event management). Additional modules such as parking and Web-based account management are also available, says Emery. Heartland went with the module model in order to give schools choices. “If we put them all in one software piece you would have clients purchasing things they don’t need,” Emery says. At its simplest, Blackboard has two modules, the basic module covers commerce, retail capability and account management. “The basic module includes dining, vending, laundry anything that’s using Blackboard readers,” says Duquette. Blackboard’s security module covers building access. Campuses have a choice of what technology they want to deploy. “Typically a customer will start with exterior doors in a few buildings, then they may work their way up to interior doors,” Duquette says. Across the vendor landscape, there are a variety of options for systems and a variety of pricing models. The key for campus decision makers is to gain a full, thorough understanding of the upfront costs to obtain and deploy a program … as well as the ongoing costs to maintain and grow it. Only when all the various components–purchase prices, licenses and ongoing fees–are understood can a campus make an informed decision on a system’s total cost of ownership.